The STARTS Prize is being awarded by the European Commission for the third consecutive year. It awards successful collaboration of science and technology with the arts. The grand prize in the Innovative Collaboration category goes to a Dutch joint venture, MX3D and Joris Laarman Lab (NL), who have succeeded for the first time in using a 3-D printer to produce a fully functional steel bridge. The recipient of the grand prize in the Artistic Exploration category is Italian interaction designer Giulia Tomasello for her biotech sanitary napkin that inhibits yeast infections. The STARTS Prize winners can look forward to receiving the STARTS Trophy and €20,000 each. 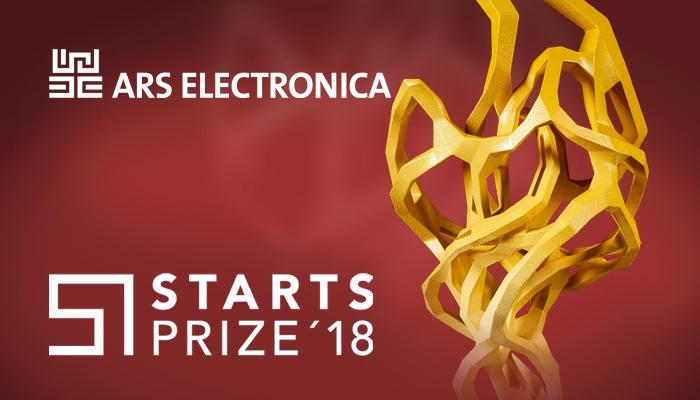 The awards ceremony will be held at the Ars Electronica Festival on September 7, 2018 in Linz, Austria. The Honorary Mentions in 2018 go to Hayoun Kwon (KR) for 489 Years; Kristina Tsvetanova (BG), Slavi Slavev (BG) and BLITAB Technology GmbH for BLITAB – the innovative tablet for the blind; Ei Wada (JP) and Nicos Orchest-Lab (JP) for ELECTRONICOS FANTASTICOS! ; Maxim Kuzin (RU) and ATOM for Fennec Turbine; the FluidSolids® AG for FluidSolids; the Making Sense Team for Making Sense – Citizen Sensing Toolkit; Rhizomatiks Research, ELEVENPLAY, evala and Takayuki Fujimoto (Kinsei R&D) for phosphere; the Morphing Matter Lab at Carnegie Mellon University for Printed Paper Actuator; Pol Jeremias Vila (ES) and Iñigo Quilez (ES) of Beautypi for Shadertoy; and to Lucy McRae for The Institute of Isolation. The STARTS Prize competition was once again conducted by Ars Electronica, Bozar and Waag. This year’s STARTS jurors are Francesca Bria (IT), Andrej Heinke (DE), Sophie Lamparter (CH), Daehyung Lee (KR), Alexander Mankowsky (DE), Seiichi Saito (JP), Kazuko Tanaka (JP), Alex Verhaest (BE) and Victoria Vesna (US). There were 2,344 entries from 88 countries submitted for STARTS Prize consideration. This prestigious award endowed with a total of €40,000 singles out for recognition innovative projects at the interface of science, technology and the arts—hence the acronym STARTS. This initiative identifies and honors projects that demonstrate the successful interplay of science, technology and art, and have the potential to contribute to economic and social innovation. The two prizewinners each receive €20,000 and will be prominently featured at the Ars Electronica Festival in Linz, the BOZAR in Brussels, and at the Waag in Amsterdam. This competition is held in conjunction with the S+T+ARTS =STARTS Initiative – innovation at the nexus of Science, Technology, and the ARTS – of the European Commission, which sees the digital transformation of industry, culture and society as the primary force driving new forms of collaboration that advance innovation by transcending the boundaries of disciplines and genres. The fundamental principle: effectively linking up technology and artistic practice is a win-win situation for both European innovation policymaking as well as the world of art. This initiative spotlights projects and people that can make meaningful contributions to mastering the social, ecological and economic challenges that Europe now faces.